What is the Roth IRA contribution limit phase out? Few people know that your ability to make a Roth IRA contribution phases out as your income rises? If you make regular annual contributions to your Roth IRA, you need to know at what point your maximum allowable contribution starts to phase out. If you don't, you might mistakenly contribute more than the allowable limit. So let's find out when your contribution limit phases out, how much it phases out, and how it impacts you. If you earn under a certain amount of money each year, you qualify to make the maximum allowable contribution to your Roth IRA ($5,000 if you're under 50 and $6,000 if you're 50 or older). Likewise, if you earn too much, you're barred from making any contribution at all. In that case, your maximum Roth IRA contribution limit phases out according to where your income falls within the predetermined IRS ranges. And exactly where your income falls within the IRS range for your tax filing status determines how much you can contribute. So if your income falls within the phase out range, how do you figure out your maximum contribution limit? You calculate your Roth IRA contribution limit phase out on a percentage basis. To calculate your limit - take your income, subtract the maximum income you can earn while still making the maximum contribution, and divide that figure by the phase out range for your tax filing status. Let's take a look at an example where the Roth IRA contribution limits phase out. 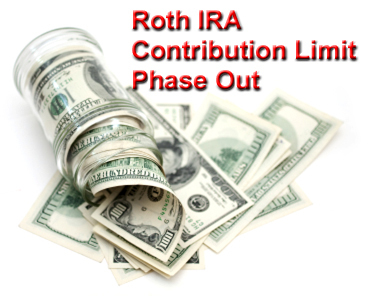 For 2011, the Roth IRA contribution limit phase out takes effect if you earn between $169,001 and $179,000. You and your spouse are 57 years old with a combined income of $174,000. At first glance, it's clear that you're ineligible to make the maximum $5,000 Roth IRA contribution, but it's also clear that you haven't passed the $179,000 cutoff for making a contribution. So $3,000 is the maximum amount you can contribute. If you were under age 50 and your maximum Roth IRA contribution were $5,000, your contribution limit under the same circumstances is 50% of $5,000. Which, of course, is $2,500. While the above featured example is accurate, your earned income isn't always a nice round number, is it? 1) Use $10 Intervals - If you calculate your maximum phase out contribution, and it doesn't provide you with an even $10 interval, simply round up to the next highest $10 interval. 2) The $200 Minimum - Unless you're altogether ineligible to contribute, your maximum Roth IRA contribution limit can not be less than $200. So if your Roth IRA contribution limit phase out calculations tell you you're only eligible to contribute $150, bump that figure up to $200. 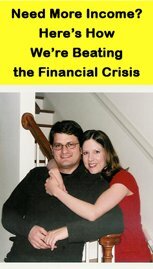 Let's say it's 2011 - you're married, 61 years old, and you and your spouse have a combined income of $178,700. So is $180 your maximum Roth IRA contribution limit? Automatically round it up to $200. Let's say it's 2011 - you're single, 37 years old, and earn $111,081.48. What's your maximum contribution limit? That gives you $4,081.48. Now, divide that $4,081.48 by the phase out range of $15,000 ($122,000 - $107,000) designated for single tax filers in 2011. Since you need to round up to the next highest $10 interval - your Roth IRA contribution limit is $3,640. But as a general rule, catch up contributions are always the maximum contribution limit for someone younger than 50 with the same income and tax filing status, plus 20%. So if you're over age 50, just calculate your contribution limit if you were under age 50. Then add an extra 20%. Your maximum Roth IRA contribution limit phases out as you earn more than the IRS income limit designated for your tax filing status. So before you make your maximum annual Roth IRA contribution, make sure your income doesn't place you within the range where your contribution limits phase out. Always use a percentage basis to calculate your Roth IRA phase out contribution limit. But remember to round off your contribution limit to the next highest $10 interval if it's not already an interval of $10. And if you're eligible to make a contribution, but your calculations reveal a maximum limit of less than $200, round that number up to $200. Follow these Roth IRA contribution limit phase out rules, and you'll have no problem calculating your exact Roth IRA contribution limit for the upcoming year. But if you still need help figuring out your limit, see Roth IRA Phase Out for more info.